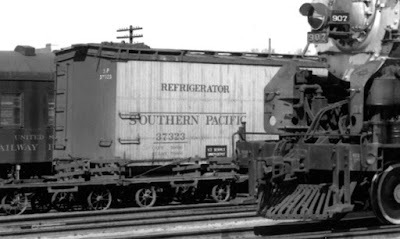 Most readers of this blog will know perfectly well that Southern Pacific provided its shippers of perishable cargoes with cars from Pacific Fruit Express, as did Union Pacific (PFE was jointly owned by the two railroads). Prior to the formation of PFE in 1906, SP did indeed roster its own refrigerator cars, but with the advent of PFE, those were all transferred to company service or scrapped. So what do I mean by my title, about SP refrigerator cars? In 1924, the El Paso & Southwestern system was absorbed into Southern Pacific. At that time, EP&SW owned 20 fairly modern refrigerator cars, and all were transferred to SP ownership, and placed in the number series 37320–37339. These had been built by Pullman in 1922 and had steel underframes, unlike all the existing SP reefers, which had truss-rod underframes and obsolete insulation. So it is probably clear why these cars were retained. They took over from the old reefers already in SP company service, most of which by this time were more than 25 years old, a rather senior age for wood-framed car bodies. 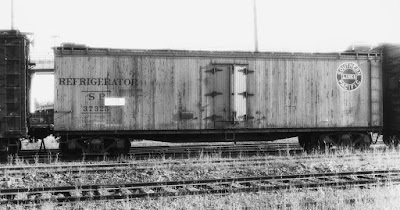 They were then used to deliver ice to company facilities such as section houses, foremen’s houses, and depots, whose only domestic refrigeration was ice boxes. They were also used to deliver ice to passenger depots where SP’s ice-activated air-conditioning systems in passenger cars were replenished. I should also mention that from time to time, SP purchased obsolete cars from PFE and renumbered them into various SPMW numbers. These cars too worked in company ice service, usually repainted entirely in boxcar red, but sometimes retaining yellow sides. I have already modeled cars like that (see my post at: https://modelingthesp.blogspot.com/2013/04/modeling-some-sp-mow-cars-part-2.html ), but those were former PFE cars, thus a different subject than the topic of the present post. One further distinction to make: PFE also had cars on its roster identified as ”ice service” cars, used to move ice from ice-making facilities to icing stations that needed additional ice. Such cars were entirely in PFE service, and would not have been used in SP company ice service, nor would the SP cars have been used by PFE for its ice movements. Photographs of the former EP&SW cars are rare — after all, there were only 20 of them — but they can be found. At the recent Cocoa Beach meeting, one example was discovered by Jeff Cauthen in the Bob’s Photo collection, and it is shown here. (Thanks to Jeff for letting me know about this image.) The photographer is not identified, but the shot was taken at El Paso in March 1949 (the photographer, of course, was aiming at handsome T&P Mountain type no. 907, and only captured the SP reefer by accident). Let’s look at reefer SP 37323 a little more closely (just a detail of the photo above). Here you can see the black placard on the car, just above the intervening baggage truck. It reads “ICE SERVICE UNION DEPOT.” There is also no “LT WT” stencil (nor any reweigh date), since cargoes will not be billed by weight. Note here that the SP road name is spelled out on the car, an indication that it was repainted after June 1946, the date when SP replaced its initials with its full name as a reporting mark. In this image, the white placard by the car number reads, “ICE SERVICE WEST OAKLAND PASSENGER YARD,” a typical assignment for these cars, in this case clearly for passenger air-conditioning ice. Note also that there are no dimensional data at the right end of the car side, as these cars were not in interchange service. I also like the somewhat quixotic use of a small black placard board, just to the left of the door, labeled “TACK CARDS HERE.” Yard clerks loved to assert their independence by tacking route cards anywhere but on such boards. You may also note in this photo that side hardware is black. But photos after World War II show that SP did not continue this practice, making the entire car side yellow. Certainly cars like SP 37323 in the upper photos could have had all-yellow sides, though the grab irons look like they might be black. The photo above also shows, beneath the car, that there is a fishbelly center sill. This brought to my mind that the Accurail wood refrigerator car model has such a center sill, and the kit is available undecorated. “Aha,” I thought, “I can model this.” (Yes, Accurail has offered, by my count, 88 different paint schemes on their 4800-series reefer, but they haven't done the SP; see their site at; http://www.accurail.com/accurail/4800.htm .) So I will give it a shot. And thanks again to Jeff for finding the photo. More in a following post.